Following our recent enhancements to our partner program, we’ve been very eager to see how our current and prospective partners would react. Well, our partners have spoken: our Office in the Cloud suite of services was voted “Best Services” by the peers and partners that attended this year’s CompTIA ChannelCon. More than 145 vendors and distributors gathered at the J.W. Marriott Desert Ridge Resort and Spa in Phoenix to exchange ideas, form alliances, check out the competition, and network with new customers and partners. We already were looking back at ChannelCon as an incredible opportunity to meet with our partners in person and better understand their needs from the cloud. 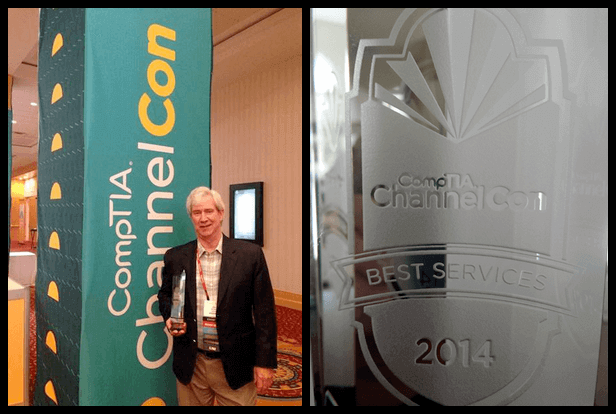 Winning a “Best of ChannelCon” award was icing on the cake. There was more good news for Intermedia: We also walked away as winner of the ChannelCon 2014 Recruitment Challenge for recruiting the greatest number of channel partners to attend the conference. For more about the other ChannelCon winners and the great things that happened at ChannelCon, check out CompTIA’s website. And in case you haven’t seen it, here’s our pledge to our partners.